Marilyn Brushes, Mason Pearson Brushes, & Denman Brushes. 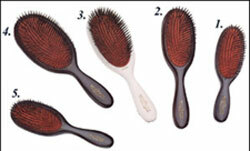 The unique rubber-cushion pad, made by hand using Mason Pearson’s original techniques, allows for effective and efficient brushing. It is kind to use and massages the scalp. We build our products to last as long as possible. While we cannot make indestructible products, we use the best materials available so that, with a little care, they should give good service.We try to make improvements continuously. We have developed our own special nylon and take particular care in our selection of natural bristles to use the best combination for each brush. Numbers in ( ) are shown above. BN Series are for Normal and Short Thick Hair.